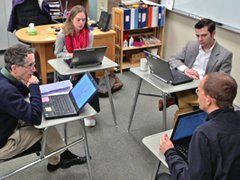 After being awarded an Investing in Innovation (I3) grant from the Department of Education, Sammamish High School, a public school near Seattle, is transforming from traditional delivery of instruction to a completely problem-based learning curriculum. With the links below, explore Edutopia’s coverage as we follow the five-year process. 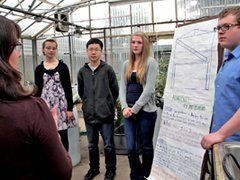 VIDEO: Teachers Meet the Challenges of PBL Implementation: Teachers at Sammamish High share their difficulties and triumphs as their school moves from traditional delivery of instruction to schoolwide problem-based learning. Teaching, Leadership, and School Change: A year after introducing us to the schoolwide PBL curriculum at Sammamish High, teacher leader Adrienne Curtis Dickinson reviews how the school’s seven key elements (more on this below) have played out in course design, professional development, and student learning. VIDEO: Building the Foundation to Transform a Public High School to PBL: Follow the journey of the teachers, administrators, and students in year one of their school’s transformation. Re-Imagining the Comprehensive High School: Adrienne Curtis Dickinson launches Sammamish High’s blog series about the seven key elements for integrating PBL across disciplines, grades, and courses. Don't miss this blog series by Sammamish educators. Each post examines a key element that is making the school’s transition to PBL a success. Getting Started with PBL: Discover how project-based learning teaches students to explore real-world problems and challenges. With this type of active and engaged learning, students are inspired to obtain a deeper knowledge of the subjects they’re studying. PBL Research Review: Studies have proven that when implemented well, project-based learning (PBL) can increase retention of content and improve students’ attitudes toward learning, among other benefits. Edutopia’s PBL research review explores the vast body of research on the topic and helps make sense of the results. Project-Based Learning Professional Development Guide: An overview of the Edutopia professional development guide for teaching how to use project-based learning in the classroom.